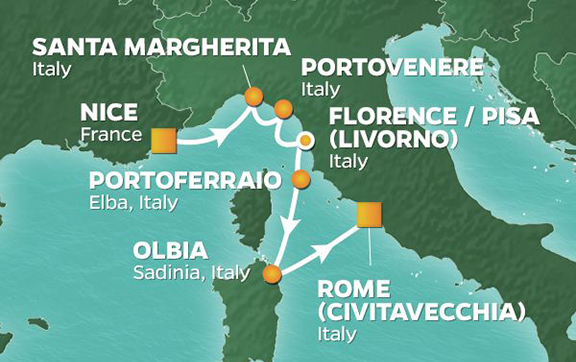 With an overnight in Livorno, you’ll be at the gateway to Florence’s classics—the David, the Duomo, and the Uffizi Gallery—and Pisa’s famous leaning tower. In Portoferraio, on Elba, visit Napoleon’s villas (he was exiled here for a decade), and take a cable car climb to the top of scenic Mount Capanne. In Olbia, or “happy town,” must-sees include the medieval San Simplicio basilica, and the Museo Archeologico di Olbia, with artifacts from Roman warships and exhibits dating to the 8th century BC. Where better to conclude your intensive Italian discovery than the Eternal City of Rome? Stay a few days to take in the most iconic sites—from Vatican City, the Colosseum, and the Spanish Steps, to the Roman Forum and Trevi Fountain. Ciao! *All prices quoted are PER PERSON in Australian Dollars and include taxes, fees and port expenses (if applicable). All prices quoted are for the cruise departing on 26Sep20. Prices for alternative departure dates may vary. All rates, savings offers and itineraries are subject to change without notice. Savings offers may be withdrawn at any time.